AMSOIL - Motorcycle -Welcome to All American Synthetics Fuel Additive Headquarters - Everything You Need to Keep Your Engine Clean! Congratulations! You have discovered the one site for all your motorcycle lubricant needs. We have everything you need from engine oil to fuel additives to coolant or motorcycle brake fluid. 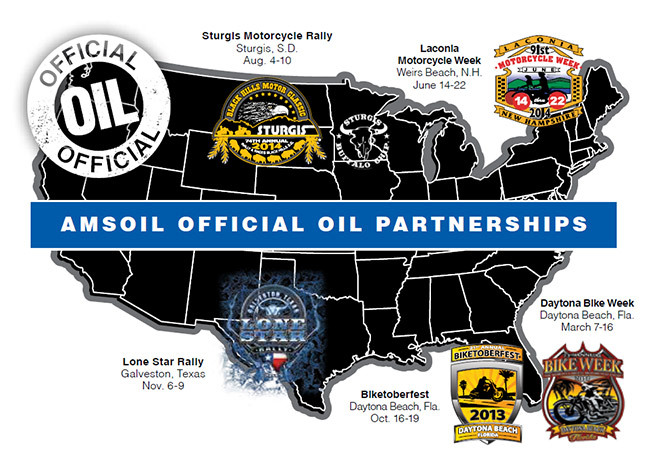 AMSOIL Motorcycle Oil is the most advanced motorcycle oil on the market. Running our oil and filter will allow you to ride twice the OEM drain interval, or one year, whichever comes first. Guaranteed! (Check out our warranty). Not only is this more convenient and allows you to ride more, your engine will run cooler and perform better than with other motor oils. You will also experience a quieter, smoother, happier running engine. There is no need to use “other brands” oil additives, its already in the oil! In fact, using other oil additives will void the AMSOIL warranty. So there is no need to worry, just ride. AMSOIL motorcycle oils are compatible and recommended for all brands of motorcycles including Harley-Davidson, Honda, Victory Motorcycles, Triumph, KTM, BMW motorcycles, Suzuki, Yamaha, Kawasaki, and Moto Guzzi. AMSOIL is the factory fill for Eric Buell’s new EBR motorcycles. In addition to superior motor oils and lubricants, AMSOIL also has created several fuel additives to maximize your motorcycles performance. AMSOIL Motorcycle Octane Boost is a newer addition to the AMSOIL line up. It is designed to increase the octane rating of pump gasoline three to four points (depending on the quality of the gas). In the Mid-West, most of the gas stations only offer gasoline with ethanol or lower octane non-ethanol gas. If you have ever attended the Sturgis Motorcycle Rally in the Black Hills of South Dakota, you have probably encountered this issue. Most bikes require at least 91 octane gas. What do you do when you pull into a gas station and the pump has 91 octane fuel, with 10% ethanol or 87 octane with no ethanol? Do you put the lower octane fuel in and rob yourself of power and gas mileage or the higher octane and take your chances with the risks of running ethanol in your high priced machine. The best option is to use a bottle of AMSOIL Motorcycle Octane Boost with the 87 octane gas. This way you don’t put corn based alcohol in your tank and the octane rating is now back up the premium level. MOB also contains a small amount of injector cleaner which will eliminate knock and ping. If you want to keep your bike shiny and clean, there is no substitute for AMSOIL Miracle Wash. It is an amazing waterless motorcycle wash. Just spray it on and wipe off the dirt and dust and grime that may have collected on your last ride. Miracle Wash is safe to use on chrome or plastic and will not scratch the painted parts. Its special formula keeps the dirt particles in suspension, so it will not scratch or make swirls. It leaves a microscopic coating behind that actually repels dust. AMSOIL Miracle Wash is a great bug remover too. There are many more products and information to explore on this website. Have a look around. If you have any questions or would like to place an order, feel free to contact us or call 1-800-717-1308.